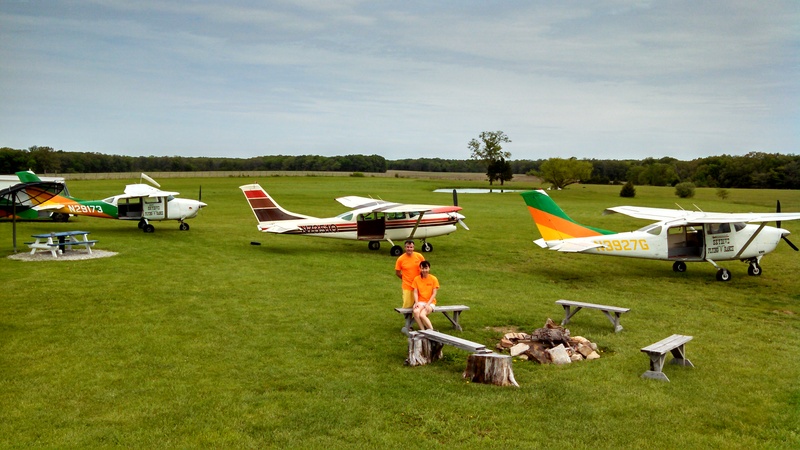 At Skydive Flying V Ranch we enjoy the freedom allowed by having our own Private Airstrip. Large groups like Bachelor and Birthday Parties can enjoy the swimming pool, Shooting Range, Fishing Pond, BBQ grill and after hours socializing in the hot tub or around the Campfire telling their first Skydiving Story. My experience growing up at an airport and as a Pilot/Pro Skydiver flying all over the US prepared us for selecting the best location to skydive. We picked this area for many reasons. Everyone wants to go Skydiving in St. Louis but with all the air traffic and congestion it is best to be a little out of the city and by studying aeronautical charts we ensured that our operations would not conflict with airliners Air Traffic control lets us go higher. As I grew up my father was the airport manager bringing the Public and General Aviation together with activities like Airshows, Ballooning, Air Racing and of course Skydiving. The airport didn’t close at sunset, evenings were spent around the campfire having BBQ and listening to skydiving and flying stories. I wanted to duplicate that and bring the joy of aviation and Safe Skydiving to the public. We have made friends in Aviation and Skydiving all over the world and many have come here for R&D and to skydive with us. See a sample here. Local pilots and Celebrities have dropped in with their own aircraft to sit and enjoy this lost experience. Our Aircraft At Skydive Flying V Ranch we use the Newest and Largest aircraft in the area for Skydiving. These Cessna U206s were designed by the manufacture for Skydiving to make make them the safest and easiest jump platforms. Additional FAA approved modifications improve the safety and performance of these aircraft making them the most comfortable and fastest climbing Jump aircraft in the area. Aerial Transport (DBA Skydive Flying V Ranch) is currently getting approval from the FAA for our installation of the most modern aircraft TurboProp engines that will make it one of the most reliable and Fastest Climbing aircraft in the World for Skydiving. We use Dual Hawk Tandem system manufactured by Strong Enterprises. The company was established in 1961 and the oldest parachute manufacturer of general aviation parachute equipment in the United States. Its products are widely used in the military and skydiving centers around the world. Strong Enterprises products have even flown on early NASA Space Shuttle Missions. We believe the Dual Hawk Tandem system is the best, safest and most reliable equipment out there for Tandem Skydiving. Only the Strong Enterprises Tandem systems are life limited. 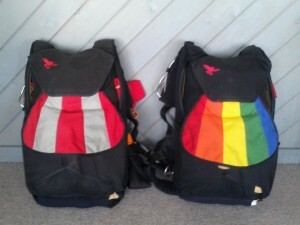 Requiring us to replace the entire system often making ours the newest Tandem Skydiving equipment in the area.